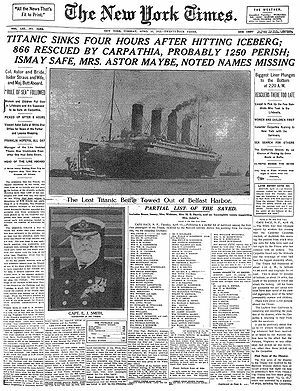 This being the 100th anniversary of the sinking it seems everything is “Titanic”. Actually.. it seems everything has been “Titanic” for the last 20 years. Nothing wrong with that, I suppose. 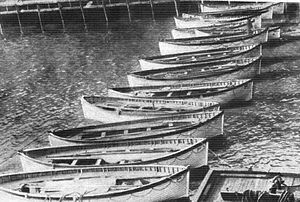 There is an addictive mystery and romance about it all, and as I pointed out in my last “Titanic” post, the sinking has led to a number of improved maritime safety laws. But all the hub-bub does seem to be getting old… well, as old as Titanic itself. Well, recently the History Channel televised a special, Titanic at 100: Mystery Solved. The following is from the Guernsey Auction house (handling the auction of all the 5,500 artifacts and ocean site). RMS Titanic, Inc. led its eighth mission to Titanic in 2010, and this mission is widely regarded as one of the most important archeological and scientific expeditions of its kind. Having assembled a consortium of the world’s leading research organizations, including Woods Hole Oceanographic Institution, the National Oceanic and Atmospheric Administration (N.O.A.A. ), The National Park Service, The Waitt Institute, and the Institute of Nautical Archeology, the expedition utilized the most advanced sonar and optical imaging systems available today. In doing so, RMS Titanic, Inc. and its partners created the first comprehensive map of the Titanic wreck site, definitively identifying the site boundaries and imaging all of the ship’s features and artifacts within those boundaries. In addition, this technology allowed the consortium to create the first-ever complete images of the bow and stern sections of the ship. The History Channel documented the expedition. The expedition included a number of professional scientists, engineers, maritime forensic specialists, and imaging experts who put together the most ambitious and complete exploration of the wreck. Mapping 15 square miles of ocean floor and photographing never before seen wreckage in HD, 2D, and 3D. Most amazing, it was all done by state-of-the-art oceanographic submersibles; no manned dives. From all this data the most complete forensic study ever made was conducted to determine the cause of the sinking. This itself took a full year. They reverse-engineered all the wreckage break-apart patterns and fit everything together graphically. The conclusions are amazing given all the past controversy and speculation from witnesses and the first expedition to the wreck made nearly 25 yeas ago. I’m going to attempt to list each item below. 1. The ship broke apart as it sank. The initial investigation right after the sinking claimed the ship sank intact… in spite of what witnesses said and the dive results from 25 years ago. Forensic investigation concludes the ship did break apart as it sank (pretty much like in the Cameron movie), with many large sections breaking off as the bow and stern sections separately descended. The bow appears to have gone down relatively flat and the stern went into a spiral spin, flinging off debris. Many of those large sections landed on the bottom relatively intact, while the bow and stern collapsed upon force of impact. 2. Poor quality rivets made the ship rip apart easier along the side from striking the iceberg as well as break up upon sinking. Extensive pressure tests using rivets from that same construction era showed the rivets were, in fact, of acceptable quality. Forensic studies also revealed that a modifide structural change at a certain point on the ship’s internal hull made prior to the maiden voyage was structurally sound. 3. A structural modification made midships was of poor design thus causing the ship to break in half. The location of this modification and the actual installation was of acceptable design and properly installed. In summary… the forensic experts believe that the ship was built better than anyone had originally thought and that the damage caused by striking the iceberg as well as the breaking apart upon sinking were the result of immense pressures at critical points that no ship could have withstood. The ship likely performed much better than any other ship at the time would have, experiencing the same trauma at that moment. 1. Captain Smith‘s disregard of being notified of icebergs in the area and negligently keeping at cruising speed. Wreckless perhaps… but it was not an uncommon practice at the time for ship captains to maintain cruising speed until icebergs were actually sited. Radio message alerts were regarded more as cautionary advisements. The captain was not performing outside of ordinary acceptable parameters for the times. 2. The were not enough lifeboats. Well, true… for everyone to abandon ship there were not enough lifeboats. But.. Titanic was not in any violation as it did have enough (actually more) according to the maritime laws of that day. It was presumed at that time that radio would provide contact to ships in the area, hence the need for lifeboats in some abandon ship scenario would be remote (the irony here is that while current maritime law requires a lifeboat seat for each passenger, in fact, the practice is not to abandon ship but rather to stay with it pending rescue -given the potential for chaos while boarding the lifeboats- as it is the best lifeboat.. which was the thinking back in 1912 also). Consider this about the lifeboat issue. Titanic did indeed launch all her lifeboats. A couple years later the Lusitania listed to her side.. and lifeboats could not be deployed. The Andrea Doria in 1956, the same thing. This year the Costa Concordia flipped on it’s side.. lifeboats could not be deployed. It’s not so much that the Titanic tragedy had ONLY 700 survivors.. but rather, because of Titanic’s stout construction design and ability to stay even keel and floating for 2 hours and 40 minutes, she allowed for 700 people to be saved. So, was anyone or anything at fault? Other than the weather being a moonless dead calm and causing mirages or other visual deceptions, or some rare climate event that caused the seas to rise and shake off a few more icebergs from the flow, it appears no one person or one thing.. or even a collection of things. The ship striking the iceberg was an accident pure and simple. The sinking was an unavoidable consequence and was not linked to poor design, materials, or construction. The loss of life is a consequence of the sinking. Could all of this have been avoided? Of course… but.. not in context with the existing maritime laws of the day. Had the laws of the day stipulated slower speeds through known iceberg areas in spite of no icebergs visually present, and had the laws stipulated each passenger have a lifeboat seat, events might have been dramatically different. This entry was posted in Current Events, Social Issues and tagged Andrea Doria, Costa Concordia, Edward Smith, History, National Park Service, RMS Titanic, Titanic, Woods Hole Oceanographic Institution. Bookmark the permalink. ← BREAKING NEWS!! Baby Boomers Are Divorcing Later In Life! Fascinating article. I’ve been doing research in to the early 1900’s for a novel I’m writing. I ordered microfilm of newspapers for 1916, and they came on a reel which also included 1912. Reading about the Titanic disaster in the words of the era gave it an immediacy and poignancy that I had not felt prior to that. I’m sure it was just an accident–but such a sad one. Thanks for writing. If you haven’t already seen the movie you might wanna rent Legends of the Fall. It’s about a family that starts in your time period that also includes WW1. I’m not sure if your book direction is taking into consideration political/historical feelings & events of the day as your character(s) live each day, or if it’s more about normal everyday living during the period in general. But I’m a history nut so I might be able to steer you in certain research directions if you need a source. Thanks for “stumbling” into my site and reading. One wonders how many of those 700 survivors ended up with post traumatic stress.. during a time know one knew it even existed.